This big cigar looks more powerful than it is. 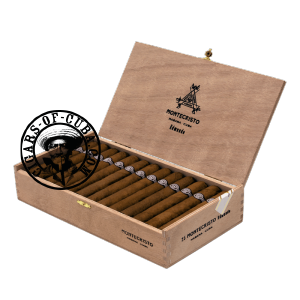 Surprisingly mild, the Montecristo Edmundo, one of the newer vitoles of the Montecristo family, has all the recognizable traits of the brand, but delivered in a gentle warm smoke, especially in the first phase of the cigar. Some power kicks in during the second and third phase, but not to the extent that one would expect for a cigar of this size (52 diameter). This cigar will need some resting time if it is to reveal the true potential of its blend. With a traditional and tested blend, this cigar is designed with a heavy ring gauge (52 diameter) and a suitable length for today's rushes (135 mm in the length). The aroma of this firm Habano, perfectly balanced with its characteristic medium to full flavor will arise even greater enthusiasm among the faithful smokers of Montecristo brand. Some power kicks in during the second and third phase, but not to the extent that one would expect for a cigar of this size. Pleasant. © 1997-2017 Cigars-of-Cuba. All products images are courtesy of Cigars-of-Cuba. Are you a new Customer ? By creating an account with our store, you will be able to move through the checkout process faster, store multiple shipping and billing addresses, view and track your orders in your account and more.